People want their seafood to be fresh and local, and they prefer to eat seafood primarily at restaurants. That’s according to results from a consumer survey shared at the 27th annual Chefs’ Seafood Symposium at the Virginia Institute of Marine Science (VIMS). 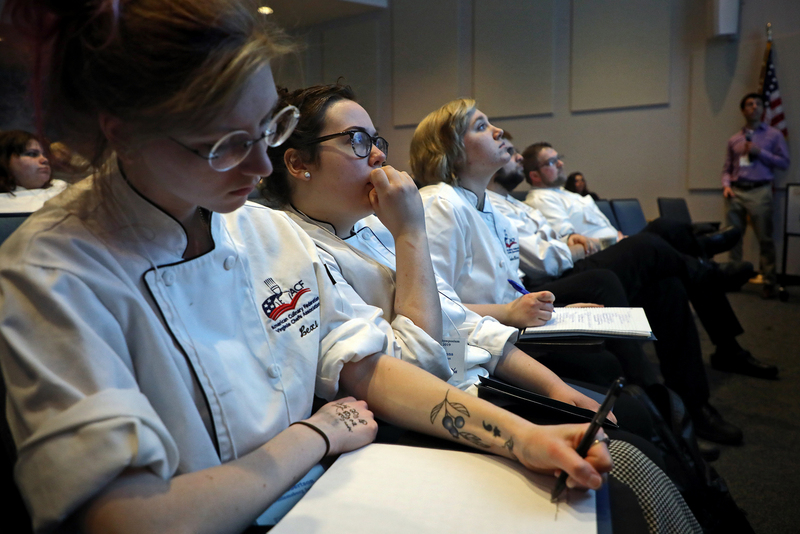 Abigail Villalba, an extension specialist at the Virginia Tech Seafood Agriculture Research and Extension Center, shared the results of a “hot-off-the-press” survey with the chefs and culinary students gathered for the symposium. After an overview of some seafood safety regulations, Villalba also discussed some of the minor nutritional differences that occur in wild-caught and farm-raised seafood. “Whether you buy, eat, consume, sell, wild-caught or farm-raised seafood, they’re both good sources of omega-three fatty acids, they’re still low fat, and high-quality protein,” Villalba said. Villalba also discussed eco-labels, the third-party certifications that indicate a seafood product meets certain criteria for environmental friendliness. Since each eco-label has its own standards, Villalba encouraged chefs to investigate what different labels require—especially as customers become more seafood-savvy. VIMS researchers also discussed some of the issues impacting the quantity and quality of seafood available to chefs. For example, a lost or abandoned crab pot can trap 16-26 blue crabs each year . Because watermen can’t find and pull up the pots, the crabs remain trapped and reduce the number crabs that can be caught in active pots. Lost crab pots also can trap black sea bass and Atlantic croaker, said Jim DelBene, a graduate student at VIMS studying this derelict fishing gear. “Watermen are not only the ones being impacted by this—also the seafood processors and restaurants that are involved in getting crabs from the water to someone’s dinner plate,” DelBene said. Patrick McGrath, a VIMS marine scientist, discussed the winter cold stuns that can be deadly for speckled trout, a popular recreational catch. McGrath said young fish in deeper water survive the drops in temperature, while the larger fish that stay in the shallows may not. One threat to some types of seafood is the plastic trash that breaks down and accumulates in the ocean. Filmy layers of disease-causing bacteria can grow on microplastics, said Meredith Evans Seeley, a Ph.D. student at VIMS studying marine plastics. As the plastics break down, they can also release toxic chemicals into the environment. Seeley said researchers are still studying the fate of different types of plastic that can end up in fish, but in some cases, contaminants from plastics can leak from the gut into other parts of the fish. Culinary students from the Colonial Williamsburg Apprenticeship Program put their seafood skills to the test in an afternoon cooking competition. Chef Walter Wilkes, owner of The White Dog Bistro, discussed the power of storytelling in a menu while demonstrating how to make his “Deadrise Chowder,” named for a traditional type of fishing boat used in the Chesapeake Bay. Culinary students from the Colonial Williamsburg Apprenticeship Program put their seafood skills to the test in an afternoon cooking competition. Chefs left the symposium equipped with practical tips on social media marketing and food photography, shared by Stephanie Heinatz of Consociate Media and professional photographer Sara Harris. "We eat with our eyes first,” Heinatz said. “When you're doing anything, whether it's behind-the-scenes in the kitchen, or after you've plated something and you're serving it, focus on photos." Each chef also received an updated seafood information card outlining the seasonal information on Virginia’s crabs, finfish, and shellfish—and an open invitation from the VIMS Marine Advisory Program to reach out with any seafood questions they may have. The Chefs’ Seafood Symposium, hosted by the Marine Advisory Program of Virginia Institute of Marine Science, connects chefs with scientific information about the seafood they serve. The 27th annual symposium included presentations on seafood safety, consumer preferences, social media marketing, crab pots, microplastics, and speckled trout. Culinary students competed in an afternoon cooking competition and attendees watched a seafood chowder demonstration. VIMS researchers discussed some of the issues impacting the quantity and quality of seafood available to chefs.